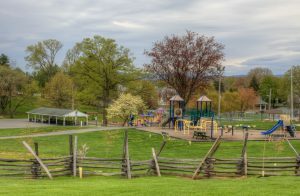 Williamsport’s own website describes the Byron Memorial Park as “small town life with that warm blanket feel.” Byron Memorial Park is your quintessential park, little league games and all. Also finding a home in the park is the Williamsport Pool, Williamsport Community Center, the local Boy Scout Troop, and Williamsport Memorial Library. Celebrate the holidays with Williamsport’s outstanding annual 4th of July Celebration or their Christmas Light Display in December. Concerts by the talented Williamsport Community Band and other groups, car shows, carnivals, weddings, picnics, and family reunions all happen here.